Art dealer Karl Haberstock counted among his customers almost all important Nazi leaders. In 1938, he helped confiscating Jewish art collections in Vienna and in the following years he collaborated closely with the "Special Mission Linz." Haberstock was arrested and interrogated by the U S Army after the war, but was later allowed to continue doing business. After a large number of unsolved cases of National Socialist art looting were made public in 1995, many European countries established independent investigative commissions. Their work has enormously expanded the knowledge of the methods used by the Nazis to dispossess the Jewish population. 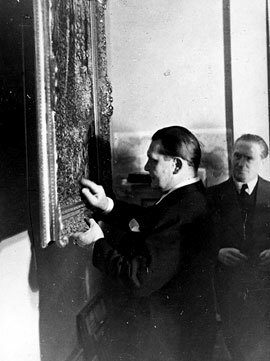 The art dealer Walter Andreas Hofer began advising Göring on his art collection in 1937. From 1939 to 1944, he acted as "Director of the Reichsmarschall&apos;s Art Collection." After the war, a French military tribunal sentenced him in absentia to ten years in prison. However, he never served the sentence and continued to work undisturbed as an art dealer in Munich. The "Hohe Schule" was to be established at the Bavarian lake Chiemsee on Hitler&apos;s request. 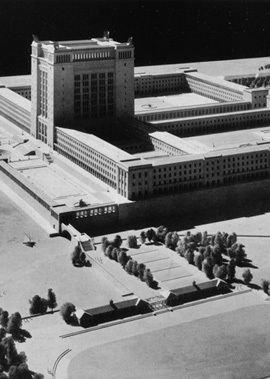 An architectural plan made by Hermann Giesler (1898�1987) was chosen in May 1938. He envisioned a façade nearly one-half kilometer long with a 120-meter tower. Its construction was never started. In early 1940, Hitler delayed construction of the "Hohe Schule" to the period after the war. He ordered all party and state offices to support Alfred Rosenberg (1893�1946) in his preparations for the "Hohe Schule". Rosenberg used this decree as carte blanche for his confiscations of Jewish archives and libraries for the "Central Library" of the "Hohe Schule" and the "Institute for Research on the Jewish Question."